He 's taking the pith Phil. Well I figured I needed to post something nice and basic so you would understand the pun. Last edited by Observer; 09-04-2013, 10:43 AM. It's on Youtube including printed lyrics. Nice song but what it's about I haven't got a clue. Apologies if this is in the wrong place but it is an original watercolour of the East End from 1902. I bought this watercolour some time ago and have since framed and mounted it. It is on paper which has been stuck to a board backing. The map is on this board backing. I think it's interesting the artist seems proud his shop is in the "Ripper area". He's perhaps not lived long in the area as his map seems muddled. He's clearly got Dutfield's Yard on the wrong side of the road and Charlotte and Oxford streets ran west to east off New Road, not where they're located on the map the artist has painted. Charlotte Street ran west off New Road before changing in to Fieldgate Street at the Plumbers Row end. Today the entire length of the street is named Fieldgate Street. Adjacent to Charlotte Street on the east side of New Road was Oxford Street which ran behind the London Hospital. Today it's called Stepney Way. 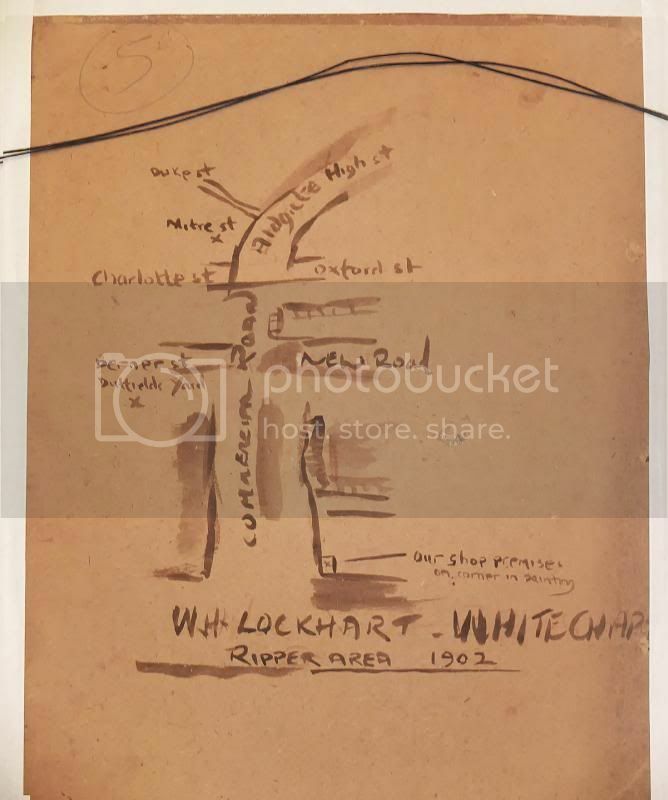 I was hoping someone who has a grasp of genealogy and the necessary resources may be able to tell me who W. M. Lockhart was and where the location of their shop was. I know there was a popular chain of "Lockhart's Coffee Rooms" at that time that catered to a working-class clientele. The police constable who found Thos. Sadler after he was mugged walked him to a Lockhart's near the Minories to examine his injuries, IIRC. Whether this has anything to do with those, I haven't a clue. 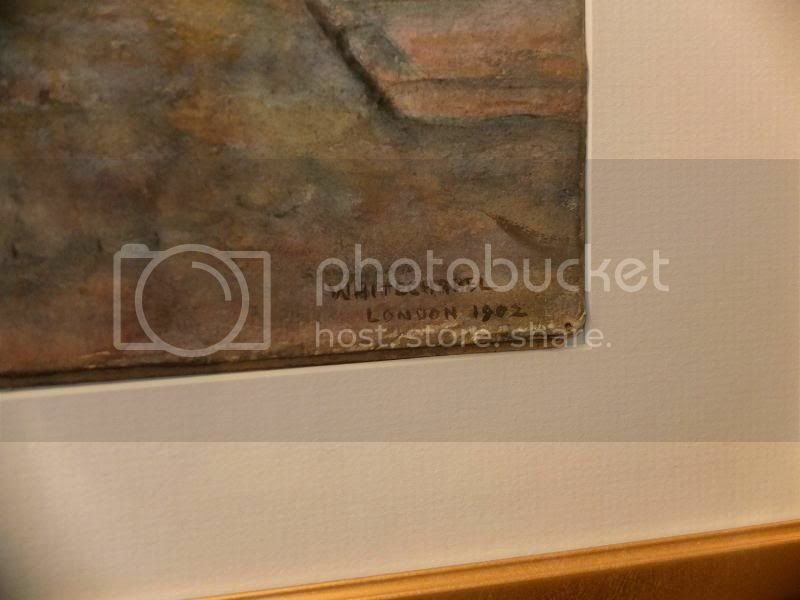 I note that the front of the painting is signed W.M. Lockhart, but the back says W.H. Lockhart. Thanks for your replies. I thought that too Ginger. 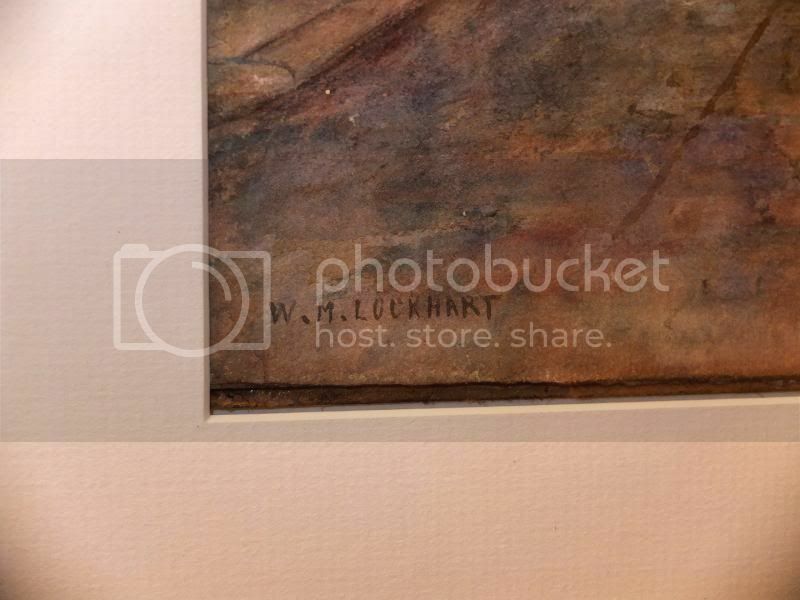 In real life though it looks as if it's just the way he's written the M. He was obviously using watercolour with a larger brush which made it less fine than the smaller brush he used on the front and when he wrote some of the location names like Dutfield's yard. Of course it's possible I'm wrong and a relative has added the back bit later. See further down. Hi Robert. Unfortunately JTR forums wanted me to sign in to see the link and I'm not a member. I searched their boards for Lockhart in threads and posts but drew a blank. Thanks for your efforts Jason. The link didn't work for me and Googling just gave me endless American genealogy links. It's only idle interest on my part. It's nothing to do with the case and it's not a relation. I thought it might have been nice if I could locate the precise location of the painting to see if the buildings are still there. It is a strange study in that the buildings are shown in part on either side of the road. That would lend weight to the idea that the painting was done by W M and the back was added, perhaps by a blood thirsty son! at a later date. I Googled "Mazzawa" which appears above the door on the right and that seems to be a surname of Italian origin. 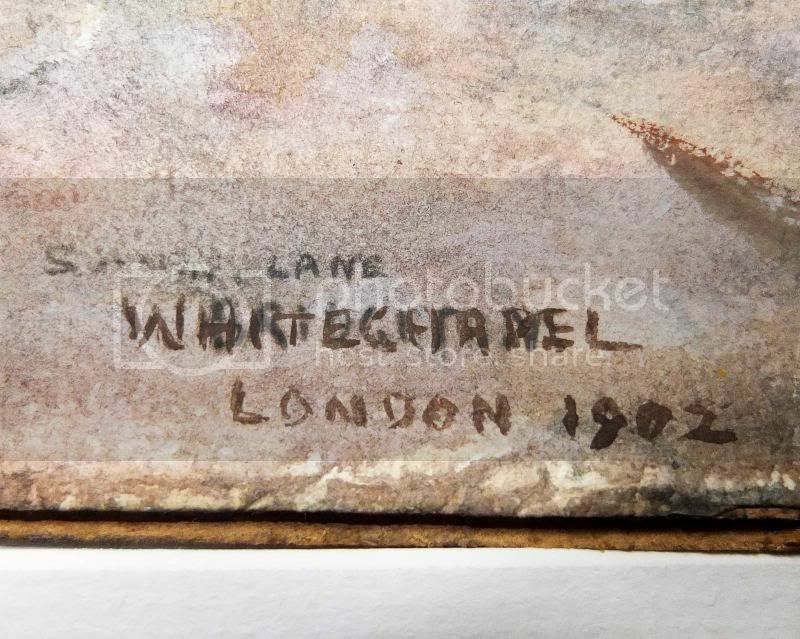 On the JTR forums discussions I mentioned the fact hat it appears that the word 'Whitechapel'in he bottom right hand corner was written over an originally different word. 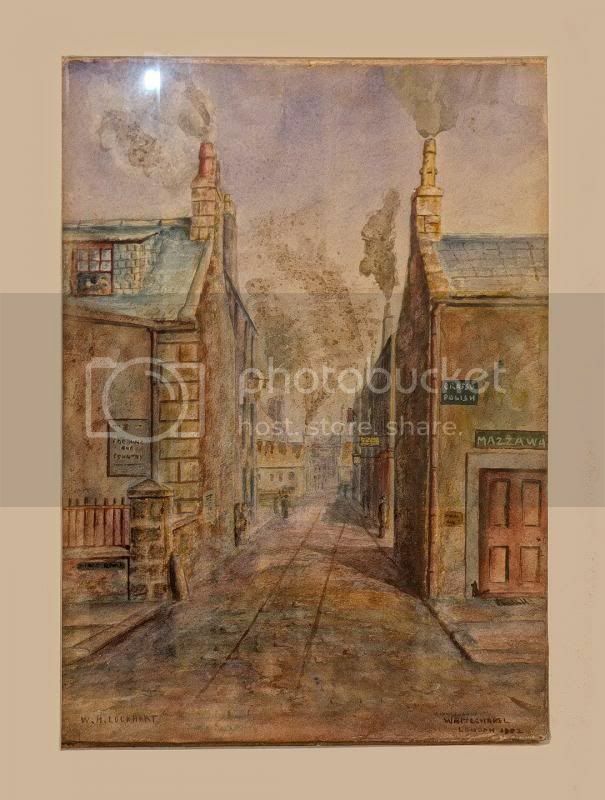 On finding some museum paintings of W M Lockhart depicting Glalsgow's East End area, I suggested the painting may have originally been of 'Bridgeton' , which can be made out if you look closely. Post-Office Annual Glasgow Directory, p. 354: Lockhart, Wm., furniture and picture restorer, 151 Sword Street. 1903 Slater's Royal National Commercial Directory of Scotland, p. 1383: Lockhart, William M., picture frame maker, 151 Sword street. Thanks Observer. That is a possibility. I concur with you Debra. Here is a photo with the letters I can make out darkened to show up better. So something or other Lane, Bridgeton looks favourite. Yet the signature doesn't look like the signature of the Glasgow artist who has a strong right slant to his. On the other hand it's unusual that both are signed in capitals. I will have to contact someone with a knowledge of Glasgow's art history. The painting itself remains a decorative curio in any case.